My1tab Extension is classified as a potentially unwanted program because it does not offer reliable services. 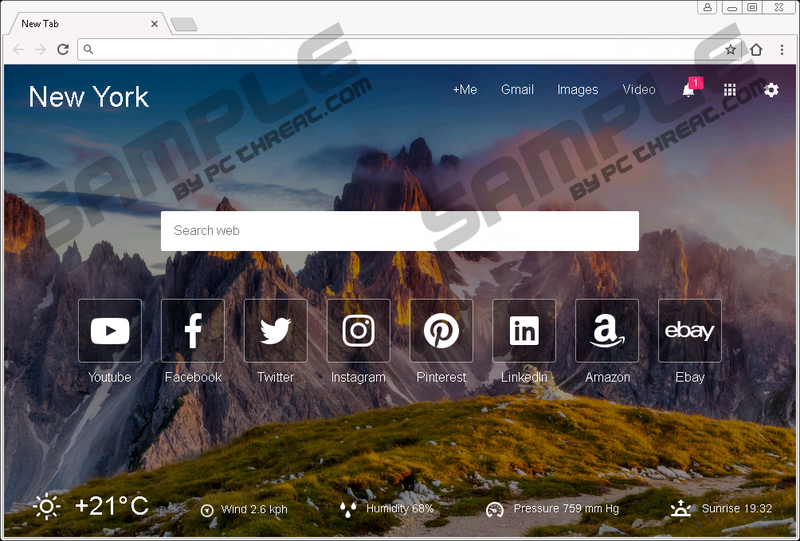 Although it attracts users by promising them beautiful background images on their new tab page, it does not offer reliable search services, and it is possible that it could put users’ security at risk. Unfortunately, in many cases, the infection is spread via installers that are full of malware. Therefore, although the extension itself is not incredibly dangerous, you need to install a legitimate malware scanner to perform a full system scan to check if you do not need to focus on much more dangerous threats. According to our research, the extension was created by Aztec Media Inc., and this company is linked to Search.geniusmediatabsearch.com, Download Manager Star, and other suspicious pieces of software that also require removal. Maybe those came bundled with the PUP? If they did, you need to delete them as soon as possible. Right now, we want to focus on the removal of My1tab Extension. If My1tab Extension has been installed onto your Google Chrome browser, my1tab.com must have been set as your New Tab page. It is represented as a regular-looking search engine with a bunch of easy-access links attached to it. At the bottom, as promised, you are shown weather-related information. At the top, you see links promoting Google services (including Google+, Gmail, Images, and Video). In the center, you can find quick-access links to youtube.com, facebook.com, twitter.com, instagram.com, pinterest.com, linkedin.com, amazon.com, and ebay.com, as well as a search dialog box. Have you discovered that it redirects search queries via my1tab.com/search?q= to search.yahoo.com? Although Yahoo Search is a respectable search provider, the hijacker can modify the results that are shown, and that is the main reason we do not recommend interacting with it. If you do, you could end up clicking misleading links, surveys, bogus prize-giveaways, and similar kind of content. Although we know that third-party content is shown, we do not know whether or not the parties who are involved could be trusted. Obviously, if they are malicious, interacting with sponsored content could be risky. If you are convinced that it is best to delete My1tab Extension, go ahead and follow the instructions below. As you can see, deleting this potentially unwanted program is very easy. Of course, if a malware scanner we have discussed previously has found other threats, you have to think if you will be able to delete those manually as well. If you cannot do that, why waste time when you can employ an anti-malware tool that will automatically erase My1tab Extension along with all other suspicious pieces of software. What should you do after this? We recommend upgrading your virtual protection. Obviously, if you install anti-malware software, this will be taken care of for you, but if you are choosing to clean your operating system manually, you will need to think about your virtual security separately. If you need our advice when it comes to that, please start a conversation is the comments section. Tap Alt+F keys at the same time to access the Chrome menu. Click More tools and then select Extensions. Click the recycle bin linked to the extension called my1tab - new tab page. Quick & tested solution for My1tab Extension removal.